How Far are the Constellations? Figure 1. Some stars in the constellation Orion are much further away than others. The poet Walt Whitman said, "I do not want the constellations any nearer, I know they are very well where they are." But where are they, exactly? Constellations cover the sky. They also look flat - the stars all appear to be at the same distance. Appearances can be deceiving. We often refer to stars that look bright as "big," and to their fainter companions as "small" stars. Are the bright ones really big? Are the faint ones actually small? Maybe the bright ones are closer and the fainter ones are farther away. Could it possibly be any other way? This is astronomy so the answer is "yes!" The distance to any celestial object is one of the most important things we can know about it. Without that single critical piece of data, everything else is almost meaningless. To understand the structure and organization of things celestial, we must know distances. The Hipparcos satellite has provided us with accurate and precise stellar distances, revolutionizing our picture of the universe. With Starry Night software it's easy to find distances to individual stars. In doing so, we discover that some nearby stars are dim, and some bright stars are nearby. We also find that some of the brightest stars are very distant. When a distant star is also a bright star, it means the star is highly energetic; shining with hundreds or thousands of times the output of our Sun! 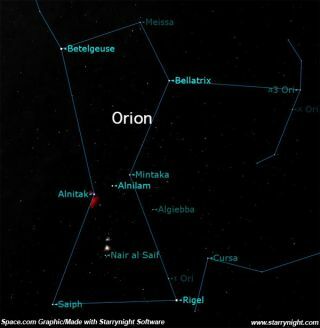 At this time of year, a prominent constellation is Orion (figure 1). Orion hosts some of the brightest stars in Earth's sky. Are they near or far? Table 1 tells us Orion's stars lie at distances ranging from 243 to 1360 light years. Rigel is brightest with a magnitude of 0.2. (Magnitude describes brightness. The lower the number, the brighter the star.) Rigel is 777 light years away and 51 000 times as bright as the Sun. Bellatrix is closer at 243 light years, fainter at magnitude 1.6, and only (!) 6 000 times as luminous as our Sun. Table 2 shows information for stars in the Southern Cross (figure 2). Notice Rigel Kentaurus, also known as Alpha Centauri, our nearest stellar neighbor. It is bright at magnitude -0.04, and lies 4.4 light years away. But it has only twice the luminosity of the Sun. Now you know why we can't begin to understand stars until we know their distance. To really get a grip on stellar distances, we have to build a scale model. Try it. It's easy! Assume your doorstep is the Sun, and one step represents one light year. Start walking the distances to the stars in the Southern Cross or Orion. Four steps will take you to Alpha Centauri. The Southern Cross stars will have you strolling from 88 to 364 steps, or roughly 70 to 300 metres. Orion will give you more exercise. You'll take 243 steps (200 m) to get to Bellatrix. Walking to Alnilam will take 1360 steps. By then you'll be about 1 km from your door! Try this with friends or a school class. With one person for each star, you'll soon have a 3-D constellation model that is definitely not flat. The stars in a constellation are not bound to one another. They are random groupings of stars upon which we have imposed recognizable patterns. Different cultures have created different (and equally valid) constellation groupings. Astronomers have established 88 officially recognized constellationsThese are based on the classic Greek and Roman star patterns, with boundaries defined by a celestial coordinate system. A constellation's stars may lie in the same direction on the sky, but they are not connected to one another. Any star visible to the unaided eye can be anywhere from a few to a few thousand light years distant. The constellations are indeed very well where they are: extending far into the reaches of the starry night sky. Enjoy their distant light!